The Brown Mansion is located at South Walnut & Eldridge, in Coffeyville, Kansas. The Brown Mansion is accessible from Highway 166 and 169. 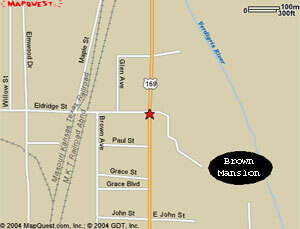 Take Highway 166 East to Walnut street. Turn right on Highway 169 South and continue to Eldridge street. Turn left into the Brown Mansion entrance. Take Highway 166 West to Walnut street. Turn left on Highway 169 South and continue to Eldridge street. Turn left into the Brown Mansion entrance. 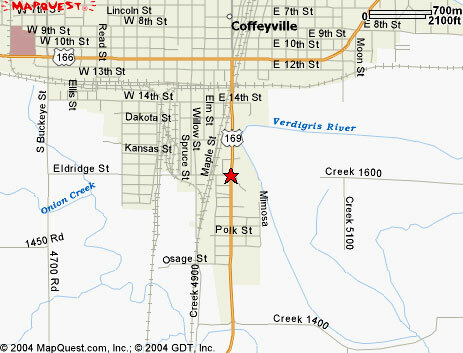 The Brown Mansion is on the right as you enter Coffeyville.